Dejero is showcasing blended connectivity solutions at upcoming shows. With enhanced reliability for live feeds over IP networks, and reliable connectivity for crews working in the field, the CellSat solution can be used in situations where cellular networks are congested or cell coverage is limited. Dejero's CellSat solution leverages the company’s patented network blending technology to improve reliability by combining cellular connectivity from multiple mobile network carriers with Ku-band IP satellite connectivity provided by Intelsat. The solution is focused on simplifying the use of multiple connection paths with built-in intelligence and automation so field crews can focus on capturing live news and events with confidence. 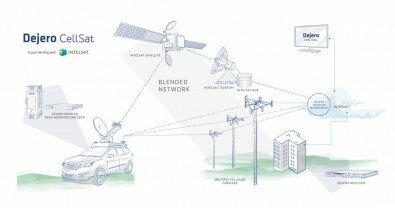 Comprised of complex algorithms, the solution automates many tasks to help you go live faster, and also communicates with the auto-acquire system to simplify the satellite connection process.Core manages the fluctuating bandwidth of individual cellular connections and dynamically allocates satellite bandwidth for optimal performance. Congestion and location are major factors when it comes to bandwidth availability, but by blending cellular with Ku-band IP satellite connectivity, the solution ensures users will be able to confidently deliver their live shot. The CellSat network is available when you need it, therefore scheduling is not required — ultimately saving time and enabling a faster response to breaking news. Instead of negotiating connectivity from multiple cellular carriers and a satellite services provider, CellSat does the hard work for you. In addition to managing satellite connectivity from Intelsat, it provides and manages optimal SIMs from leading carriers in your region, resulting in one unified connectivity service — all users need is a Dejero receiver to reconstruct the transmitted video for SDI or IP playout. The equipment and software is designed for easy of use in the field, and monitoring usage and performance is managed in the cloud.The control management system gives users the power to manage CellSat from a web browser, but it can also be set up and remotely to control transmitters and receivers, monitor and route ingests, view performance data, and generate usage and billing reports to help manage your operational costs.